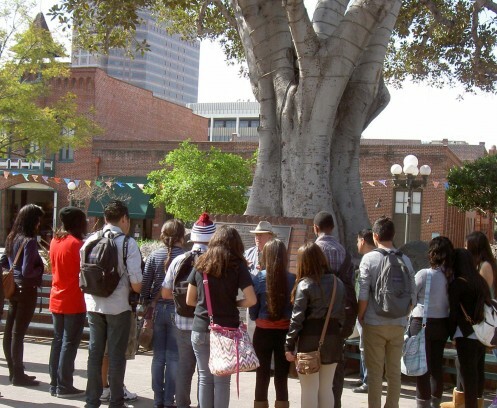 Las Angelitas del Pueblo offers free walking tours of El Pueblo de Los Angeles Historical Monument, home to the Pico House, Olvera Street, the Avila Adobe and other fascinating remnants of our city’s past. Las Angelitas docents guide visitors on an imaginative journey through the early history of Los Angeles from its beginnings as a Spanish farming community, to its heyday as a center of Californio culture during the Mexican rancho period, and, finally, to the changes that accompanied the U.S. takeover, putting Los Angeles on the path to becoming the American metropolis we know today. Please see Free Tours for details. Interested in volunteering to become a docent? The next Docent Training class begins Wednesday, July 24, 2019. See Become a Docent for more information.